If you have handled fuel, you must have realized that at some point, you will be required to transfer fuel from one tank to another. Needless to say, we all know how messy this can be, especially when you lack proper equipment or tools. It is not just the inconveniences and the accidental spills, your own safety and that of your car are compromised. Fortunately, fuel transfer pumps were invented to take these risks and all the hassle away. These equipment feature flexible intake hoses, quality construction, filter screens and suction power that will fetch fuel from any level. If you intend to acquire an efficient fuel transfer pump, count yourself lucky if you are reading this. 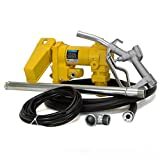 The intention of this post is to act as an eye-opener so you may lay hands on one of the Top Best Fuel Transfer Pumps. Suggesting you check the cans for storing gas or fuel. Top on our list is the Fuelworks Fuel Transfer Pump that boasts of all charm features required to make your work a breeze. Built from heavy-duty cast iron, this pump boasts CSA certification and is mechanically safe for fuel transfer. It is explosion proof and is designed to tackle flammable fuels such as kerosene, gasoline, and diesel. With its compact yet powerful 12V motor, this piece of equipment delivers up to 15GPM/57LPM. Safety is a priority here owing to the safe mechanical seal, lockable nozzle holder and the bypass valve built. For versatility, Fuelworks features extensible suction tube, 14 ft. discharge hose and 5m power cable. Overall, this is a great fuel transfer pump for the price. For over 50 years, the Fill-Rite has been known to do a decent job. 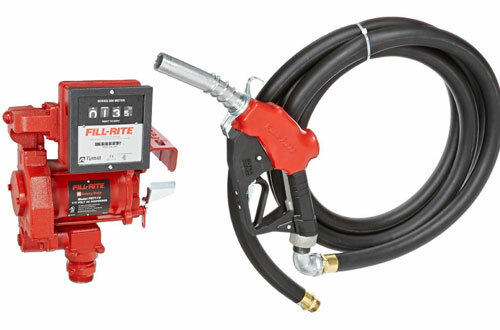 If you are looking for a DC pump that will give you full-range flexibility and versatility even in the most difficult situations, look no further than the Fill-Rite FR4210G Fuel Transfer Pump. 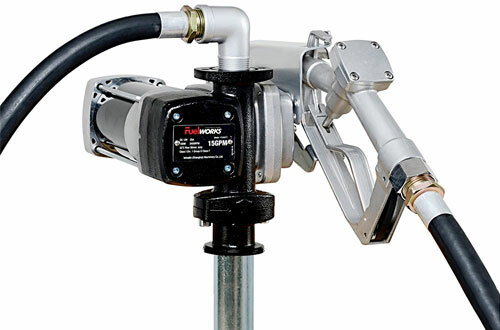 Equipped with a 12V motor, this pump delivers a flow rate of 20 GPM. 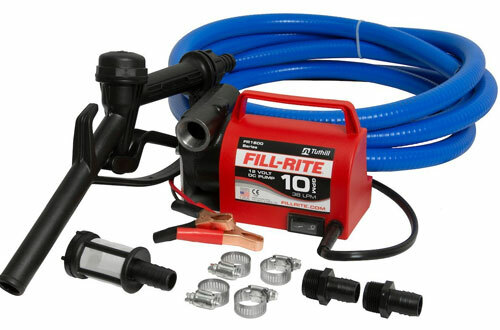 Plus, Fill-Rite also boasts of the corrosion-proof adjustable suction pipe, check valve, bypass valve, and a manual nozzle. You won’t spend any bucks on lubrication, thanks to the ball bearing construction. Other robust features include the explosion-proof magnetic motor, digital pulse output meter and machined carbon vanes. 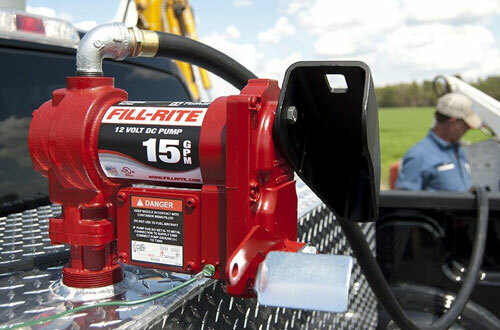 Basically, nothing beats Fill-Rite Fuel Transfer Pumps when it comes to solid performance. Fuelworks 10305708A is another solid performer that will transfer fuel in the shortest time possible. 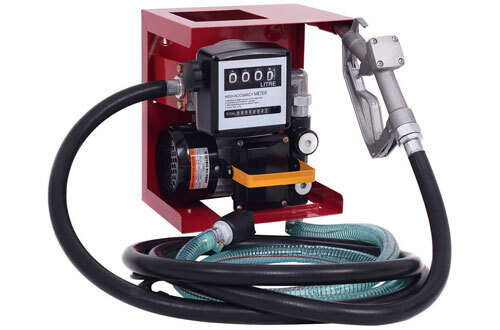 Designed to dispense gasoline, kerosene, and diesel, this pump delivers a flow rate of 5GPM/57LPM with its compact 12V motor. 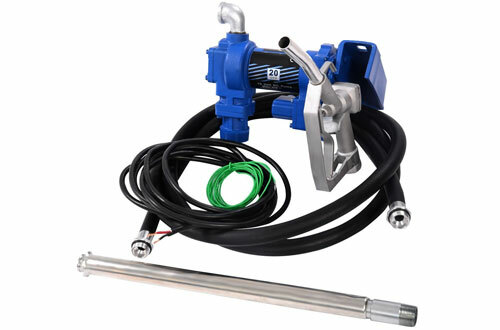 To make your fuel transfer easier, this pump features an extensible suction tube, lockable nozzle holder manual nozzle plus the flexible 14 ft. discharge hose. Just like other Fuelworks models, the black Fuelworks 10305708A is CSA certified. To prevent any fire outbreaks, thermal protection is included. Other prominent features include the filter screen, bypass valve, and 5m power cable. Generally, this pump is a great pick that walks the talk. When you have farm equipment, generators and cars around, you need Goplus 110V Electric Diesel Pump for hassle-free fuel transfer. It is an efficient unit that has a flow rate of 60liters per minute. To enhance transfer accuracy, this pump has a thirteen for manual nozzle hose plus a fueling meter that will keep you updated with the stats. The heavy-duty cast iron construction is for sure durable. Another adorable aspect of this pump is how easy it is to use, this is not rocket science. Furthermore, being a self-priming vane pump makes simplifies usage. 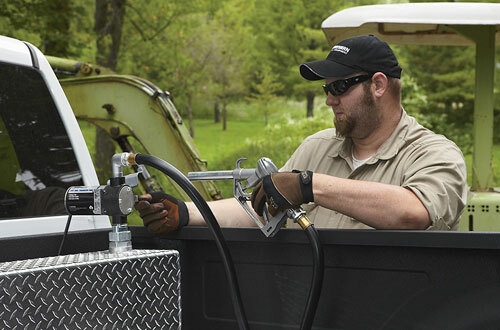 A multipurpose fuel transfer pump that is designed to work with almost everything, ranging from lawn tractors to snowmobiles. This miracle-working machine will transfer mineral spirits, gasoline, diesel, kerosene, hexane and much more. Most impressive is the fact that it doesn’t require lubrication, thanks to the built-in ball bearing. Besides, this pump is also explosion proof. With a fuel transfer capacity of 20GPM, Goplus surely makes the best choice for high-capacity fuel transfer. Furthermore, Goplus 12V Gasoline Pump keeps thieves away with its padlocking option. Another great choice for those looking for a self-priming 12V fuel transfer pump. Hands down, even though this unit may not be the best in the market, it delivers an outstandingly fast flow rate of 8GPM. Designed with dependable 30-minute duty cycle, this pump is suitable for tank or barrel mounting. To help with power connection, 6.5ft. the cord is included. 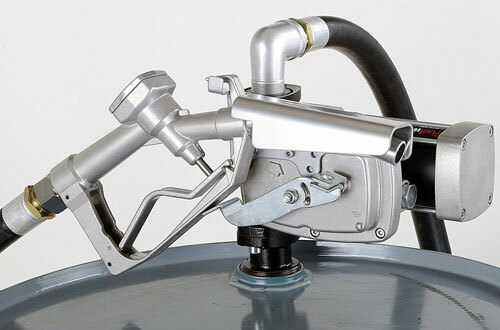 To increase efficiency and prevent hose bending, this unit features a ¾ inch inlet and outlet that is integrated with the swivel connector at the nozzle. You can also utilize the 2inch tank adapter and attach this pump to a drum. 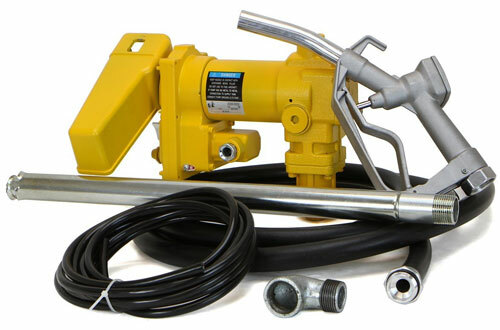 Other robust features include the aluminium nozzle and the 40inch steel telescoping pipe. This is another favourite fuel transfer pump that has held the legacy for a very long time. When it comes to professional-grade service delivery, nothing beats the Fill-Rite FR1614. It can only be used with antifreeze or diesel and not gasoline, waste vegetable waste or alcohol. It has a filter strain to keep contaminants and impurities away. Plus, the 10GPM flow rate works just great for most applications. Flexibility is well considered here given the 8 ft. 3/4inch hose and the plastic 3/4inch nozzle. The cast iron construction is pretty durable, not to mention the self-priming capability. Also, note that the Fill-Rite FR1614 is powered by DC voltage. This is another top model that deserves the crown. 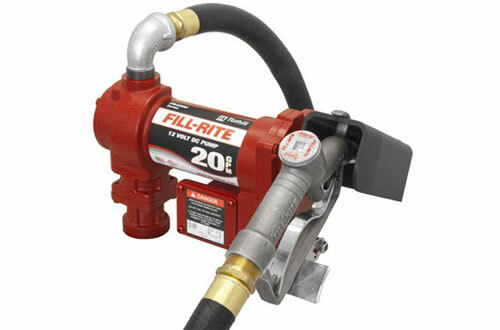 Having built its own reputation for years, the Fill-Rite transfer pump boasts a number of robust features. It has an explosion-proof 115V HP motor that is also UL listed. To ease reduce pressure drop and relief pressure, this pump features an integral check valve. High-quality carbon seals and carbon vanes reduce wear and tear. The strainer keeps away contaminants and easy to remove and clean. Threaded bung eases tank opening. Other adorable features include thermal overload protection, junction box, and a heavy-duty switch. To sum it up, this makes the best pump for fuel management systems and will last a long haul without disappointments. 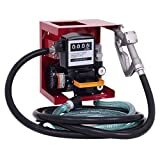 This is another outstanding fuel transfer pump that works like charm. These are the kind of equipment that you lay your hands on and feel like every single buck spent is worth it. It is to install and get started, regardless of the application. With a flow rate of 20GPM, this unit is suitable for barrel or tank mounting. It is safe and convenient to use with gasoline, diesel, kerosene, mineral spirits, Hexane and Heptane. Boasting of RPM speed of 2600 and max suction lift of 8 ft. the XtremepowerUS does a pretty decent job. 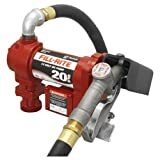 Fill-Rite FR1210G is a decent fuel transfer pump that works great and doesn’t require a lot of tweaks during installation. It is an industry leader that will handle most fuel fluids such as kerosene, diesel and pumping gas. This pump has a flow rate of 15GPM/2600RPM at a maximum lift of 37”, which is pretty cool for most fuel handlers. 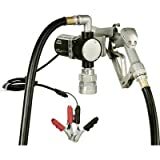 For solid performance and versatility, it features 12-foot static wire hose plus a manual nozzle. If you have any DC power source, an amp draw is included to make your operation much easier. A strainer is well incorporated to keep away contaminants. Plus, two threaded base makes tank mounting a snap.